Maurice Carlos Ruffin, whose essay “Beginning of This Road” appears in Rebecca Solnit’s and Rebecca Snedeker’s Unfathomable Cities, will be one of several contributors signing that book at Octavia Books on Tuesday, November 5. Beginning at 6 p.m., Maurice will be joined by Rebecca Snedeker and other contributors Eve Abrams and Billy Sothern. 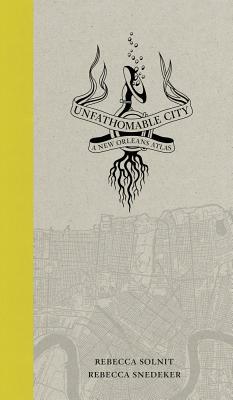 Unfathomable Cities pairs twenty essays with twenty-two full-color maps in a stunning exegesis of post-Katrina New Orleans and its surroundings. This entry was posted in New Orleans Lit Events, Peauxdunquians in the World and tagged Billy Sothern, Eve Abrams, Maurice Carlos Ruffin, Rebecca Snedeker, Rebecca Solnit, Unfathomable City by swampytad. Bookmark the permalink.